The TTC Board met on July 11, and the public agenda contained little that prompted extensive debate. The entire meeting was over in 75 minutes, a quite unusual situation reflecting the onset of the summer break at City Hall. The status of the streetcar order from Bombardier prompted a spin-off discussion of the subway. CEO Andy Byford had noted that reliability on the Yonge line’s fleet of TR (Toronto Rocket) trains has reached a world-class level, and it is quite substantially better than that of the T1 trains operating on Bloor-Danforth, although their performance is reasonable for cars of their age (about 15 years) and technology. This prompted a question from Vice Chair Alan Heisey who asked when the TTC should be making plans to replace the T1 fleet. Chief Operating Officer Mike Palmer replied that “we probably had to order the cars last week”. (See YouTube video of meeting.) This came as something of a surprise to the Board thanks to the way that planning for the Scarborough Subway Estension (SSE) and Line 2 BD in general have been handled, with information dribbling out bit by bit, and with plans in the TTC Capital Budget not fully reflecting future needs. I wrote about this in a previous article, but as an update, here is the status of various projects related to the BD line’s future. This is not simply a matter of TTC management providing a rosy view of capital needs, or of the City choosing to ignore the scope of the problem. When projects of this scale don’t appear in the “to do list”, they are not considered any time another government comes calling with a funding offer. Many projects that will receive money from Ottawa’s infrastructure fund (PTIF) are on that list because they were acknowledged as part of the TTC’s outstanding requirements. Keeping the full needs of the Bloor-Danforth subway out of view short-changes the TTC system and the riding public, and politicians are surprised to find that the “ask” for transit spending is a lot bigger than they thought. Meanwhile new projects make claims on “spending room” that might exist only because needs of the existing system have been downplayed. TTC management plans to bring a consolidated report on the renewal of the Bloor-Danforth line to the Board in September 2017. The need to order cars “last week” arises directly from the evolution of the subway fleet plan, and the changes forced onto it by the SSE. First, a brief description of the existing subway fleet. The T1 fleet is about 15 years old, and all of these vehicles are now used exclusively on Line 2 BD. They are not equipped with Automatic Train Control (ATC) equipment, and they will not be able to operate on Line 1 YUS or Line 4 Sheppard once these cut over to ATC operation in the next few years. A retrofit of ATC gear to these cars would be of limited use on Line 2 BD because it will not switch to ATC until the mid-2020s when these cars will be due for replacement. Most of the new TR trains are in 6-car units, and these are used on Line 1 YUS. The fleet is large enough already to handle the extension to Vaughan in late 2017 and some increase in service once ATC is fully operational. However, there are not enough 6-car TRs to allow operation at the minimum headway projected for ATC of 1’50” between trains. A further order will be needed to achieve that level of service. There are six 4-car TR trains used on Line 4 Sheppard. There is no plan to acquire more trains, and service on Sheppard could be increased from the current peak level of four trains to at most five trains (leaving one spare). In order to provide a reliable public transit service and meet future ridership forecasts, it is essential to maintain the existing subway car fleet in a state of good repair, and provide fo timely replacement. The T1 fleet requires replacement as it reaches the end of its useful (30 year) life in 2026; this necessitates the procurement of 372 new passenger rail vehicles at a projected cost of $1,737 million. The timing of spending on this project is shown in its detailed budget. Note that about one third of the spending is post-2026 and therefore beyond the scope of the City’s ten-year capital planning window. From a budgeting point of view, it is useful to have the T1 replacement project a decade in the future because little of the spending would appear in the current ten-year projection. The flip side of this is that none of the currently announced support programs for transit spending by various governments look that far ahead. The SSE extension service is shown as operating effective in 2023, a date long-known to be unachievable. The opening is now tentatively aimed at 2026. Procurement of replacement cars is shown as starting in 2026 and running through 2030. This aligns with a roughly 30-year lifespan for the T1 fleet. Plans for ATC on Line 2 now show this project completing in 2024, and the SSE would be built as an ATC-only facility. Therefore, a new fleet must be completely in place before the SSE can open. The total number of trains the TTC would have by 2031 is less than what they claim to need (69 vs 71). Accelerating the provision of a new fleet would be challenging on the basis of a completely new tender and design, whereas resuming production of the TR trains would avoid the need for prototyping. However, this would only be possible with a sole source contract to Bombardier who are not the TTC’s favourite supplier at the moment. Moreover, the entire project would shift forward and add pressure to spending during a period when the City does not wish to incur any new debt to finance capital projects. There is no funding in the City’s Capital Budget for these trains. The seven trains shown in the fleet plan for “SSE procurement” are not included in the SSE budget. The yard is completely full, and there is no room for a new fleet to co-exist with the old one during a multi-year delivery period. The carhouse and shops are designed around the married-pair consist used for T-1s and all previous cars, not the 6-car trainsets that would replace them. There is no land available for expansion. The Capital Budget contains only $7m to provide for property acquisition and preliminary planning. There is no funding for actually building the carhouse. 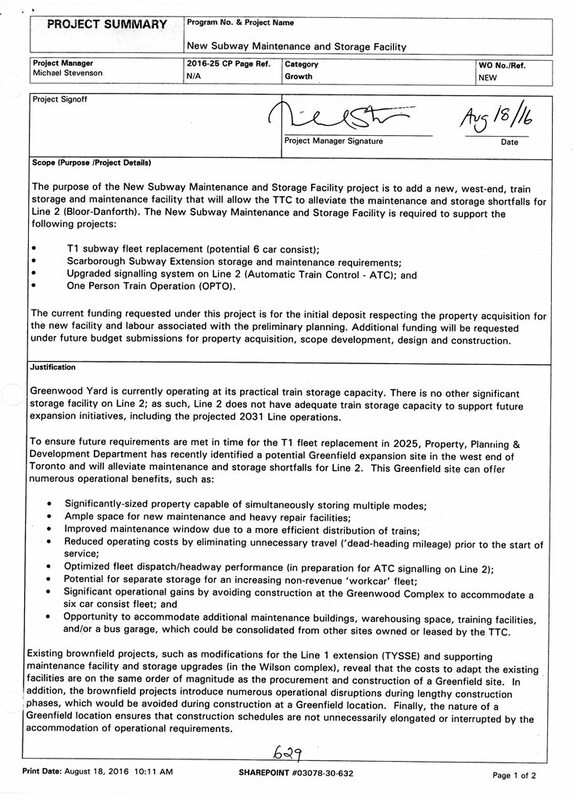 A small offsetting saving might be available in the SSE budget because planned storage tracks at STC station would not be required if there is a new yard at Kipling. East end storage (but not maintenance) of new BD trains to balance the process of loading and unloading service from the line. 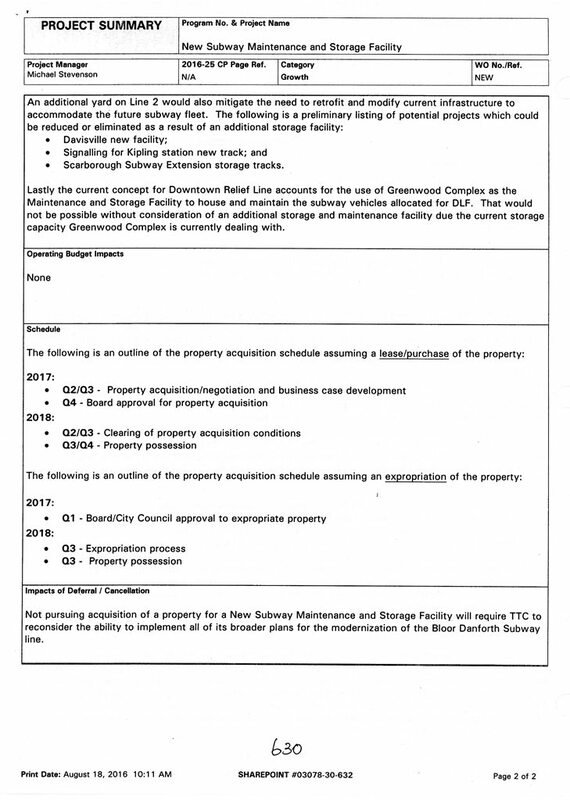 Storage and maintenance for Relief Line trains that are likely to be shorter than the full 6-car units planned for BD. A central site for the growing work car fleet. This schedule fits well with opening the SSE in the mid 2020s by which time the entire route would have ATC signals. However, the T1 replacement plan as it now stands would not finish until about 2030 leaving an ATC system that could not be “turned on” because there would still be non-ATC trains on the line. The approved budget for this project in 2016 was about $300m, but this has been reduced to about $251m based on a “capacity to spend” analysis that claims the TTC would not actually use all of its allocated budget. To complicate matters, the estimated cost of the project is now $431m. Therefore, the City’s 2017 Capital Budget only funds about 60% of the project. A well-known problem at Bloor-Yonge is that the platform capacity on both the upper (Yonge line) and lower (Bloor line) levels, as well as the vertical connections between them, is not adequate to handle current demand under peak conditions. When delays remove the ability of trains on one level or direction to remove passengers arriving at a platform, congestion can be quite severe. Plans for ATC operated trains on Yonge, and eventually on Bloor, will allow trains to run more frequently so that the service capacity keeps up with the arrival rate of transferring passengers, but that is only half of the problem. With trains arriving more often, the “feeders” into the station will also have more capacity, but the stations will not be able to absorb the additional circulation demands. A few schemes have been proposed to add capacity in the past. The first version would have involved closing Bloor Station for a period of construction and moving the tracks further apart so that a third platform could be inserted. This idea has, thank goodness, fallen off of the table, even though its initial stage, the widening of existing platforms, was completed years ago. Beyond $6m for planning work, none of the estimated cost of over $1b is included in the City’s Capital Budget. The question of platform edge doors (PEDs) comes up from time to time, and estimates that are now a few years old pegged their cost at about $15m per station. ATC is a prerequisite so that trains will be stopped accurately aligned to these doors. PEDs will improve safety at busy stations where crowding could force passengers dangerously close to the tracks. PEDs will keep litter off of the tracks and reduce subway fires. PEDs will prevent trespassing and suicide attempts. The scope of a PED project depends on just which of these goals one is trying to address. If it is only a question of crowd control at major stations, then a system-wide implementation would not b required. However, if the goal is prevention of access to the track at all locations, then the scope and cost would be greater. There is no money in the Capital Budget for PEDs, but any planning for such a project should be clear about its goals, and therefore the scope of work involved. Other stations suffer from platform congestion, and this will have to be addressed as demand grows. A major side-effect of running more trains/hour with ATC is that passengers will be delivered to busy stations faster than they are today. The backlogs of would-be riders trying to board inbound from Finch to Eglinton in the AM peak could translate to overloaded platforms at stations without adequate exit capacity notably College and Dundas. There are plans for additional exits from these stations, but they depend on adjacent developments and public funding. (The chance for a north entrance/exit to Dundas Station was lost when no government would step up with the funds so that this could be built concurrently with the new Ryerson building at Gould Street.) Moreover, such exits should have capacity for large pedestrian flows, and not be treated as emergency stairway-only exits. St. George Station is another interchange point where the volume of passengers on platforms and of conflicting movements between lines will grow as the level of service on either subway lines increases. This entry was posted in Finance, Subways, Transit. Bookmark the permalink. Several other stations – I’m most familiar with St. Andrew – are already seriously (even dangerously) crowded at peak with existing headways. I can’t imagine it will actually be possible to get everyone off the platform and out of the stations with trains arriving in both directions every 2 minutes. What recourse does TTC have to improve rider “throughput” at platform level, especially where it is very difficult to add additional stairs, escalators, or exits? Steve: Yes, a big problem at many locations. It is compounded whenever a pathway is shut down for maintenance (usually an escalator). After years of talking up the benefits of ATC, the TTC is only now starting to acknowledge and study station capacity issues. Would this new train order be a seven car train fleet that would operate on the Yonge University line and displace the TR trains to the Bloor Danforth line? If not are there still plans to lengthen the YUS trains? I have not hears such plans mentioned for a while. Steve: At this point, I have heard two versions, one with the longer trains on YUS, one with them on BD. It actually makes more sense to put them on BD because facilities on the Yonge line have already been modified for 6, not 7, car trains. The new carhouse at Kipling can be built appropriately. I didn’t mention this in the article because this would be part of the report expected in September. Jeez… I just came from London, UK and despite the amount of people using their system they have a simple way to deal with overcrowding which is to close a station and let things dissipate. Yes they have more lines but the idea is the same. When you have too many trains entering the station at once in one of the busiest cities in the world you need to limit the amount of people. See here. For years the TTC has focused on more trains and forgot about fire code which limits them amount of people that can be in the stations at any given time. I wonder if the TTC has considered doing such things during the rush hour to help alleviate some traffic into some stations. I wonder if they have thought about rebuilding the Yonge and Bloor Interchange in the sense that they make it deep level UNDER the existing buildings. It may be possible but it would be a hell of an engineering project. I honestly don’t think the TTC will be building the extension until the 2050s at least. When they realise they will have capacity limitations inside the actual stations, a need for new trains etc they will delay the project. Steve: Closing/bypassing stations is an option for emergencies but not for day-to-day practice. As for the fire code, it only applies to new stations or to those undergoing substantial modification. It would be interesting to find out whether running 30% more capacity qualifies for that trigger. The interchange has to stay at the level it is because it must connect to all of the neighbouring tunnels. As for 2026 … 2030 … 2050 … the decision is political, and I cannot see the current crew backing down from giving Scarborough “what it deserves”. At the very least, the Line 2 extension will have ATC “roughed-in” and the Relief Line will already be ATC. Steve: But there remains the problem that the ATC project thinks it will be finished and will decommission the old signals before all of the ATC-equipped trains are delivered. Nonsense. Platform doors will also allow for air conditioning at the stations. When a station is as busy as Bloor-Yonge, the crowding alone has the effect of raising the temperature. People with medical conditions like high blood pressure are affected. Less humidity and heat in the stations will reduce the amount of medical emergencies which slows the system. Expanding underground metro stations costs a lot of money. This is not something like Appleby GO station where one can build whatever on adjacent parking lot space. Expanding College Station will affect the foundation of the Aura building. The TTC is better off spending money getting the relief line built earlier. This is why there are several Tokyo Metro Shinjuku Stations. Instead of expanding them, it is cheaper just to build a new line with stations close to each other. Steve: Actually the south end of College Station is north of Aura. If you look at this street view, you will see where the vent shafts come up to street level, and these are just south of the platform. The relief line is supposed to get people away from Line 1 and especially changing trains at Bloor-Yonge. Indirectly, it will also relieve Union Station. Someone coming in from Pickering or Unionville on GO can get off at East Harbor Station. Take the relief line into Yonge and Queen or perhaps University and Queen. The PATH system will take them to the office towers. This way, they do not have to get off at Union and board a crowded Line 1 train. The relief line can easily bring 20000 people per hour. Try adding 20000 people per hour capacity on either Line 1 or Line 2 is like asking for a miracle. The TTC needs to stop planning in isolation. They are always reacting to a problem as opposed to anticipating them. When VIA’s HFR project is complete, there might be a chance that trains might not terminate at Union but at Summerhill. The dedicated track route is suppose to start at Toronto and end at Montreal via Peterborough and Ottawa. Getting those trains to terminate at Union will not be easy. What will that do to demand projection? If they are serious about 7 car trains then they cannot consider putting a 50′ long car into an existing consist as it would totally screw up door placement. They have to design a new train with all cars the same length. Either seven 71′ long cars or six 81′ long ones. I don’t know if the latter is possible because 81′ might be too long for the existing curves. There still remains the question as to whether the pocket tracks and yard tracks will handle 500′ long trains. Until that question is answered it is useless speculation. Why is the lifespan of the T1 cars a measly 30 years? The cars built 20 years before them lasted 40 years (that I’m guessing was at least 10 years beyond their intended lifespan?). Was there really no improvement in QA from the 70’s to the 90’s that allowed the end-user to get another 10-20 years out of the T1’s over the H-series RS? Steve: The original H series were built for the BD opening in 1966. Successive batches up to the H-4s handled system extensions through to 1974. These were the last cars before the introduction of solid state controls. The H5 and H6 series came along later with the H6s replacing the by-then 30 year old original G trains in the mid-80s. Thirty years later the last of the H6s (always problem trains) have been replaced by the TRs. No subway cars in Toronto, with the possible exception of the G trains, have been designed for more than a 30-year span, and some have had problems lasting that long. Should the T1s be replaced in the mid 20s? One might argue that they will have more life in them, but that’s difficult to know in advance and based on past experience we cannot count on this. Moreover, the need for ATC on the BD line’s trains would make keeping the T1s for a long time difficult. I thought the issue with Dundas was that Ryerson didn’t want the exit built into their property for trumped up security reasons, and the decision was made that the new exit would be put in on the south side of Gould, where a demolished building has left an empty lot. King Station also has exit capacity issues, given that it only has one narrow stairway and one escalator to street level at King St. The lightly used Melinda St exit doesn’t provide much help because most people are exiting to King St proper and the streetcars. I wonder if the accessibility improvements proposed to begin consultations next year will include a general expansion of stairways out, if that’s even possible? The funny thing is, most people would assume the tunnels when you say that. However, I wonder if the curve at Union would be the real deal killer due to the longer cars causing too wide of a gap with the platform. As for the pocket tracks, didn’t the TTC look into running nine car Gloucester trains which would have been about 500 feet? Is the new yard a done deal? It seems everything is dependent on getting the Keele MSF up and running. No Yard – no space for TR trains. No TR trains – no way to implement and use ATC on Line 2 and the SSE. But the TTC has a solution! The original signal gear they are pulling out of the YUS and keeping for spare parts as they are no longer made. Why they only need a kilometer or two of signals – re-install in the SSE and keep using the T1 trains for their full design life and longer, as is usual for the TTC. Steve, love your article – clear and to the point – but very scary – makes me afraid that the inmates on the board are running the asylum! Steve: The new MSF is at Kipling, not Keele. Approval to acquire the property has already passed City Council. The TTC has been eyeing this for a while now. As for the SSE, it’s more than a kilometre or two, roughly the same length as the line from Eglinton to Finch. And I’m not sure I would want to open a new subway in 2026 with signals from the 1970s. Steve: And I’m not sure I would want to open a new subway in 2026 with signals from the 1970s. Notwithstanding that the SSE project overall reflects a mindset firmly stuck in the 1960s. Norman Wilson said: Notwithstanding that the SSE project overall reflects a mindset firmly stuck in the 1960s. Steve says I cannot see the current crew backing down from giving Scarborough “what it deserves”. There is really no present or future crew that won’t be supportive of moving forward with the SSE. Also sad there is a handful in this City that refuse to evolve from Transfer City and work with the subway plans. Steve: It’s a lot more than a handful, but if it makes you happy to think we’re just a sad, little band, go right ahead. If the SSE was built in the 60’s, 70’s or 80’s, Scarborough would have been taken over by the province due to its fiscal incompetence after trying to build a one stop subway extension completely isolated from the rest of the subway network. Real plans for an east-west robust transit link ie. subway in and serving the lower core have been around for about a century, and still nothing adequate, despite usually good efforts from GO and TTC. 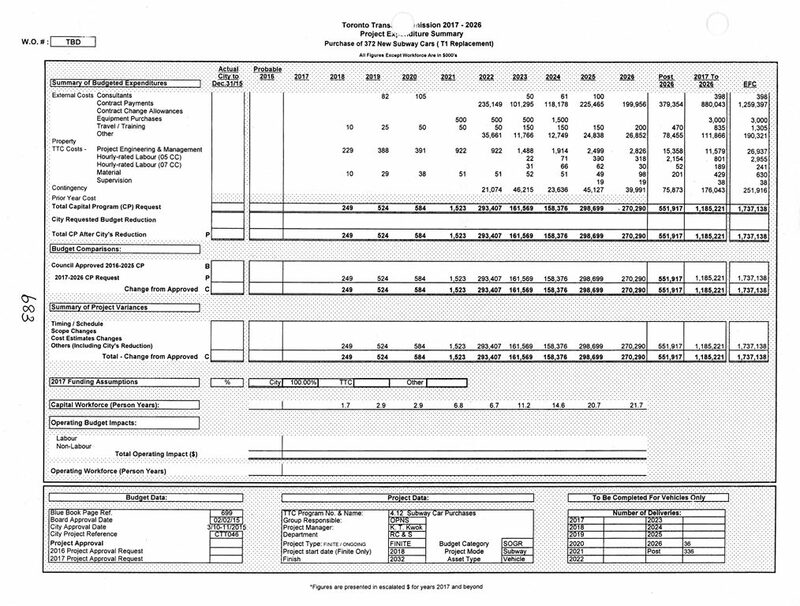 Planning should involve looking at numbers of riders and cost-benefit and all sorts of things beyond elections. New, faster/sub-regional service is decades late, and odds are high with most everyone around and the outvoting of core, the ice caps are doomed. Steve: The irony is that downtown voters like me don’t give a damn about the DRL from a personal point of view because I would probably never use it for a “relief” trip — that’s what the folks in the burbs would do, and the relief benefits everyone by reducing crowding on the central system.